The effectiveness of an acupuncture treatment is strongly dependent upon accurate Chinese medical diagnoses. 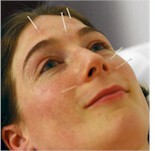 The practice of acupuncture is based on the theory of meridians. According to this theory, vital energy or qi and blood circulate in the body through a system of channels called meridians, connecting internal organs with external organs or tissues. By stimulating certain points of the body surface reached by meridians through needling, the flow of energy and blood can be regulated and diseases are thus treated. Acupuncture points reside along more than a dozen major meridians. There are 12 pairs of regular meridians that are systematically distributed over both sides of the body, and two major extra meridians running along the midlines of the abdomen and back. Along these meridians more than 300 acupuncture points are identified, each having its own therapeutic action. First, the practitioner selects appropriate acupoints along different meridians based on identified health problems. Then very fine and thin needles are inserted into these points. The needles are made of stainless steel and vary in length from one half of an inch to three inches. The needles are usually left in for 15 – 30 minutes. During this time, the needles may be manipulated. Needle manipulations generally involve lifting, twisting or rotating the needle depending on the specific health problems. According to the World Health Organization Report on Acupuncture: "...the therapeutic effects (of acupuncture) depend greatly on the proficiency of the acupuncturists – their ability and skill in selecting and locating acupuncture points and in manipulating the needles." Acupuncture can be remarkably effective in many conditions. "Since its therapeutic actions are achieved by mobilization of the organisms' own potential, acupuncture does not produce adverse effects". World Health Organization Report on Acupuncture. Together with acupuncture, herbal medicine is a major pillar of Chinese medicine. Although the Chinese pharmacopoeia lists over 6000 medical herbs, there are about 600 herbs in common use today. The unique characteristic of Chinese herbal medicine is the degree to which formulation is done. Herbal treatments rarely prescribe a single herb to treat a condition. A Chinese doctor will create a specific formula for each patient which usually contains at least 4 to 20 herbs. Decoction is the traditional method of preparing medicine and is taken in a concentrated form of tea. Our sister company Lian Chinaherb AG is one of the leading Swiss suppliers of Chinese Herbs. The European Union is currently drafting regulations on the use of herbal medicines and their import restrictions. It is the policy of ChinaMed to meet or exceed any compliance requirements with regard to the safe handling, usage, or distribution of herbs as dictated by any legal or governing body.